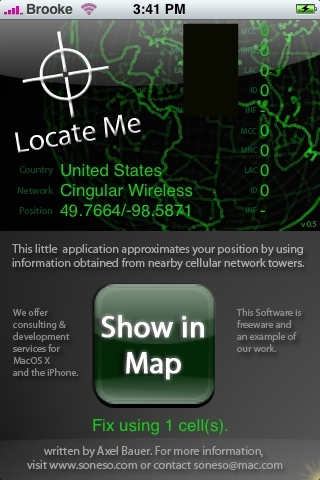 I’m guessing that since this app tracks the device via cellular towers, this app wont work on the Touch…. does this also work with routers scanned by verizon like the new map.app? if not, who needs this? noone? No, it uses cell towers. I personally LOVE this app and think it is SWEET! I guess it is directed toward iPhone users! This app is not working for me. I used the NateTrue jailbreaking method to 1.1.3 and running on t-zone hack. Any help? i have an iphone im from venezuela an it finds me in venezuela and find my phone service provider but when a hit show in map it shows im in the pacific ocean does anyone know how to fix this ?? ?